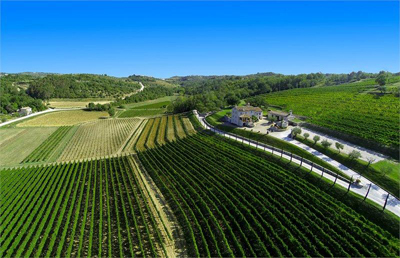 This winery is situated at the northwest side of the Istrian peninsula, at the altitude of 275m above the sea level. Marvellous view stretches from Alps and Dolomites on one side to the lush greenery of intact nature and beautiful sea panorama on the other. Their vineyards are located on the hills Stancija and Kanedolo, near the village of Momjan. The soil consists mainly of clay and is rich in marl giving the wines their characteristic local identity. Through hard work and dedication in the vineyards they grow grapes that reflect and express the region and climate. No great wine was ever made without good grapes. This means that vineyards are the birthplace of great wines. At Kabola they care wholeheartedly for their vines, going over every detail, watching them carefully like they would their own children. Since 2009 the winery produces all grapes organic and environmentally friendly. Kabola was the first wine cellar in Istria with an Eco-certificate.